Chocolate is heavenly. Chocolate rules. Chocolate, my friends, is a terrible thing to shun on a diet. With this recipe, you can have your chocolate and eat it, too. It’s a pudding made with high-protein, super-nutritious tofu. And if you think you don’t like tofu, get over it. Tofu takes on whatever flavor it is paired with, including chocolate! So, dive into this Mexican Chocolate Pudding recipe from The 17 Day Diet Cookbook. Place all the ingredients in a large food processor. Cover and process until smooth, about 1 minute, scraping down the inside of the bowl at least once. Divide into four ramekins or small bowls; serve immediately or refrigerate. Tip: It’s important to get the silken extra-firm tofu. Mori-Nu sells it in packages that are shelf-stable, no refrigeration needed. Please use cocoa powder, not hot cocoa mix. The pudding is not pourable but very thick. You have to scrape it out of the food processor. A blender will not work because the tofu is so thick. Dr Mike Moreno's 17 Day Diet is a revolutionary new weight-loss programme, structured around four 17-day cycles, that activates your skinny gene so that you burn fat day in and day out. 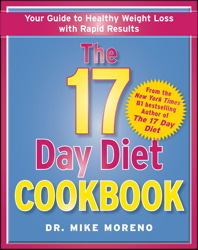 Each phase comes with extensive lists of what dieters can and can't eat while on the phase, but also offers acceptable cheats.The 17 Day Diet Cookbook provides delicious recipes for all the meals, snacks and treats featured in The 17 Day Diet, allowing you to plan your menu to fit perfectly into your diet. Dr Mike knows that a diet can only work if it's compatible with the real world, and so he's designed the programme with usability as a top priority.